Zach Parise is just one goal away from the State of Hockey scoring title. Parise registered career points No. 699 and 700 to lead the Minnesota Wild to a win over the Los Angeles Kings last week, then tacked on No. 701 with a goal in their win over the St. Louis Blues on Sunday. That last one was especially significant: Parise is now tied with Warroad native Dave Christian for the most goals scored by a Minnesota-born NHL player. Parise is just the third Minnesotan to score 300 goals, and the fifth to reach 700 points, joining former teammate Matt Cullen, Christian, Neal Broten and Hall of Famer Phil Housley. Housley, who registered 1,232 points in 21 seasons as a defenseman, is well out of reach, but with Parise under contract through 2025 and scoring at a point-per-game pace, he’s well positioned to move into second within the next few years. Passing Christian, a fellow North Dakota alum, would represent a significant milestone in its own right: Parise would become the Fighting Hawks’ all-time leading NHL scorer. Parise has compiled 291 of his points in his seven seasons with the Wild, fifth on the franchise scoring list, while his 146 goals are good enough for third. He’ll have a hard time catching teammate Mikko Koivu, who has 670 points in 14 seasons, all with the Wild. 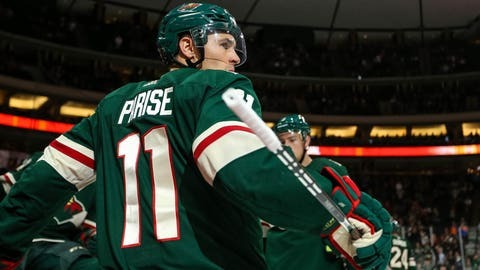 Parise stands a better chance of catching franchise scoring leader Marian Gaborik, whose record 2019 goals nine seasons remains the Wild standard. The milestone chase represents a bit of a turnaround for Parise, even if many of them would have been in reach in spite of his multi-season slump. Parise, 34, was plagued by injuries and ineffectiveness in consecutive seasons, registering just 42 points (19 goals, 23 assists) in 69 games during the 2016-17 season, his lowest full-season totals since his rookie season. He battled a back injury last season, managing just 16 points (seven goals, nine assists) in 17 games, but broke through down the stretch, managing 12 goals and three assists in 18 games down the stretch. Parise missed the final two games of Minnesota’s playoff series with the Winnipeg Jets, but was effective when he played, scoring in each of the first three games. He returned professing renewed confidence in his once-ailing back, and ranks second on the Wild in scoring with 16 points in 17 games.